Nigel had been pondering what to do with his listed granary for years. Of typical brick and half-timbered construction, seen quite commonly in Herefordshire, one of the gable and wall frames were in such a state of disrepair, that collapse seemed the most likely outcome the next time the wind blew. Quotes from restoration firms were beyond the budget constraints and so Nigel was not optimistic when word of mouth led him to approach us at Castle Ring Oak Frame. 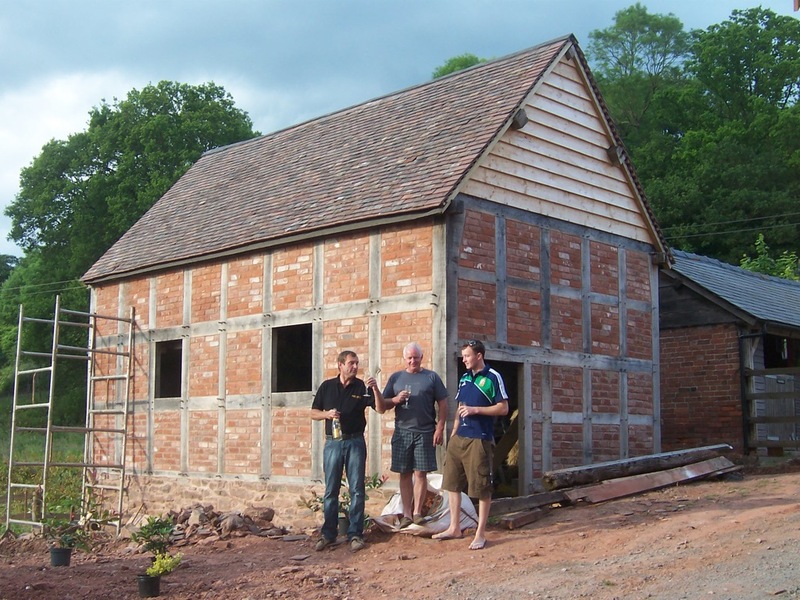 An initial assessment of the granary didn’t put us off and we came up with a proposal to replace the whole of the gable and wall frame in one go! Nigel liked our practical hands on attitude along with our quotation, and contracted us to carry out a survey and for the replacement timber frame. While the carpentry was being carried out at Castle Ring, Nigel came into his own, removing two sides of the building with a sledge hammer and propping up the unsupported roof with temporary acroprops. How he did it we don’t know, but somehow he lived to tell the tale. On raising day, once again we were blessed with good weather and the difficult work began to assemble the frames whole, and then jack them up to connect to the existing structure. Careful preparation and surveying meant that everything fitted perfectly and that costly additional site work was avoided – in fact the raising crew had packed up and left by 4 o’clock. Special mention must be made of the home cured bacon and fried potato lunch prepared for us by Nigel! Please could we have this every time we put up a frame?